Proflight Zambia bookings qualify to participate in our exclusive travel vouchers for travel reviews program. Merely email a writeup of your flight to cheapflights@southafrica.to and we'll send you vouchers. Help with Flight Quotes - SouthAfrica.TO travel agents are itching to assist you! 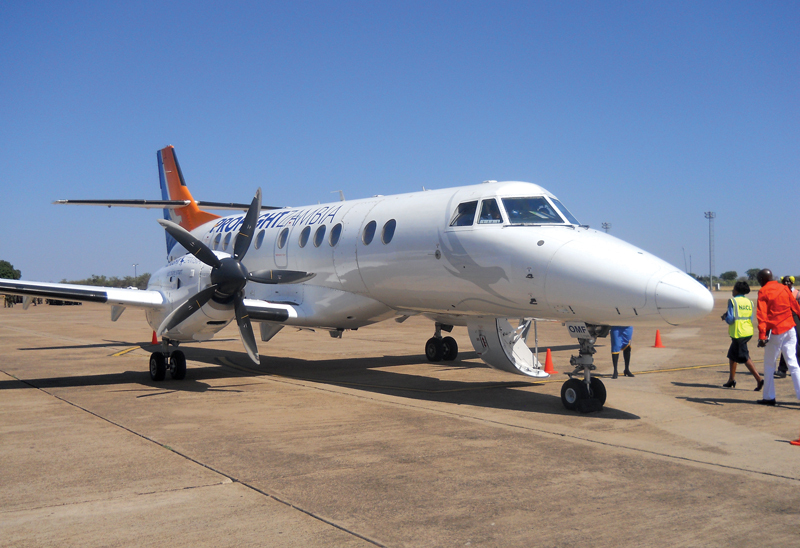 Proflight Commuter Services Limited, known as Proflight Zambia, operates scheduled flights between Lusaka, Mfuwe, Solwezi & Livingstone, and is considering flights to Johannesburg. Tony Irwin founded the airline in 1991, however there are other investors in the business. 25 January 2018: Proflight has had to suspend their Lusaka - Harare flights due to the situation in Zimbabwe. The service will resume on the 1st of March 2019, provided the situation in Zimbabwe has improved. 31 August 2015 : From the 22nd of September 2015, Proflight will offer three return flights per week between Lusaka and Durban. They will make use of a 50-seater CRJ-100 aircraft. If the demand can justify it, they would like to introduce a 4th weekly flight. From the 22nd of September they will offer 3 weekly return flights from Zambia to Durban. They will use a 50-seater CRJ-100 aircraft. Jetstream 4100, Jetstream 3200 & Cessna Grand Caravan aircraft. 22 May 2015 : From 1 July 2015 Proflight will be flying directly in to Kafue National Park, Zambia's largest National Park. They will fly on Mondays, Wednesdays and Saturdays to Chunga. The Lusaka – Chunga flight will leave Lusaka at 11:30, reaching Chunga at 12:45. The Chunga – Lusaka flight will leave at 13:05 and arrive in Lusaka at 14:20. 10 Oct 2014 : Proflight Zambai just announced a new route from Ndola, Zambia to Lubumbashi, Democratic Republic of Congo that will take off on from the 14th of October 2014. This service will be offered three times weekly. Lets hope that Joburg flight is still in the works! Jan 2014 : Rumours are mounting that Proflight Zambia intends to start flights from Johannesburg to Lusaka. Fastjet plan to start operations in Zambia, and will want to fly JHB-LUN. If Proflight Zambia gets in ahead of them, they'll have an advantage on the route. 31 Dec 2013 : A Proflight flight from Lusaka to Solwezi develops a technical fault and returns to Lusaka's Kenneth Kaunda Airport. “Proflight Zambia prides itself in its excellent safety record and at no point was there a danger to passengers or crew,” said Ms Gillian Langmead, a spokesperson of Proflight Zambia. With the recent crash of a LAM Mozambique flight, safety in the African airspace is under the spotlight. March 2013 : Delivery is taken of a B727-200, the airline's first jet plane. 1991 : Tony Irwin, previously a pilot at Zambia Airways, starts Proflight Air Services.